It’s F1 testing time again, and the guys at the Lotus Formula One Team decided to make this little video with Roman Grosjean and new boy Pastor Maldanardo. F1 drivers are usually not the best of actors, so no Oscar Nominations here, but it’s still quite a funny video, especially seeing a Formula One car towing a Caravan/Camper. 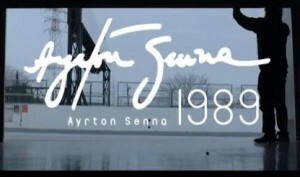 Honda have released the video below as a tribute to their favorite Formula One Son, Ayrton Senna. It’s been 19 years now since that fateful day in Imola, and we have witnessed many Formula One drivers come and go, and even the supreme reign of Michael Schumacher, his retirement, and then his second F1 career, but in all that time there has never been another Ayrton Senna. Yes, Michael would do anything to win, and yes Vettel seems cast from the same mold, but neither of them are Senna. The tribute is unusual and unique. Sound technicians placed speakers all around the Suzuka track, along with identification lighting to mark the position of the car on the track, then when night fell, the sound of Ayrton’s spectacular Suzuka lap was replayed in real time, sounding like he was once again taking that lap around Sukuka. Pretty amazing stuff, and a tribute only fit for a legend. The first video is the actual lap, while the second one shows a lot about what went into making it all possible and the setup. Unfortunately the behind the scenes video is in Japanese only, but if you watch it the pictures tell the story, and there is even a rare look at the original telemetry printouts from Sennas lap that helped to re-create this amazing lap. Ron Dennis has always had a vision of turning McLaren into one of the great supercar manufacturers of the world to rival companies like Ferrari and Lamborghini. First it was the McLaren F1, then the Mercedes Benz SLR McLaren, in conjunction with Mercedes, and now the second fully designed and built by McLaren Supercar, the MP4-12C. McLaren Automotive is the road going division of the McLaren Group of companies. They unveiled the Frank Stephenson design in late 2009, and the car itself was launched in 2011. The MP4-12C has a carbon fibre composite chassis, and has the McLaren built M838T 3.8 litre V8 twin turbo engine powering it. The engine develops 616 brake horsepower and has around 443 foot pounds of torque. The power is sent to the wheels through a seven speed F1 style seamless shift dual clutch gearbox, and is packed with Formula One technologies like brake steer, where the inside rear wheel automatically brakes a little during hard cornering to reduce understeer. The video below is an hour long documentary about the McLaren MP4-12C and how it is built. After a somewhat processional 2013 Monaco Formula One Grand Prix, Sebastian Vettel and Lewis Hamilton have traded blows in the media. 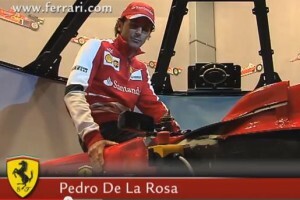 After the HRT Fomula One team folded up at the end of 2012 Pedro de la Rosa was left without a F1 drive for 2013. Known for his many years as a great test and development driver, many expected him to return to his former employer McLaren as their test driver, but in kind of a surprise move he instead joined Ferrari. Ferrari were not lacking in test and reserve drivers, they have several on the payroll, but Pedro could bring both recent race experience, and before that years of development and testing experience with McLaren, plus hundreds and more likely, thousands of hours spent driving in and developing McLarens F1 simulator, making him a good signing for Ferrari. With the very limited on track testing in F1 these days, the teams all turn to simulators and simulation technology to test as many things as they can. For the top teams, even on race weekends while the teams are at the race track practicing, qualifying and racing, the data gathered is immediately transmitted back to the team headquarters where test drivers will be hard at work in the teams simulator re-running the completed sessions and testing different setups and options. The conclusions from that testing is then communicated back to the race team at the track, giving them more information from which to make the decisions on how to set the car up, or to help with strategy decisions. Ferrari has lagged behind with their simulator technology for the last few years, struggling with the data like their well documented struggles to get their wind tunnel data to match up to the on track performance. It’s for this reason they snapped up de la Rosa with his years of experience n the McLaren F1 Simulator, to help them get their simulator program back on track and to the point where the results can be related back to the car on track 100%. In this interesting video we see the current Ferrari simulator, plus Pedro goes indepth about a lot of the processes and technology behind it all. A good insight for sure. Formula One viewers from around the world are familiar with Martin Brundle, former Tyrrell, Zakspeed, Williams, Brabham, Benetton, Ligier, McLaren and Jordan Formula One driver between 1984 and 1996, and then F1 commentator for the BBC and now Sky Sports in the UK form 1997 through to the current season. Martin for a good part of his BBC commentating career was paired with longtime British Formula One Commentating legend Murray Walker. For those not familiar with Murray, here is his bio. Affectionately known as “Muddly Talker” Murray is famous for his commentating gaffs and mixups, but is also one of the foremost Formula One authorities around. Back in 1998 the opportunity arose for Martin to take Murray for a ride in the McLaren Two Seat Formula One ride car so Murray could experience a F1 car at speed for himself. McLaren built the two seater in 1998 as a way for VIP’s and non F1 drivers to experience a F1 car for real at speed. It was designed and built by McLaren cars, designated the MP4-98T by a team led by Barry Lett, with obviously a lot of help from the F1 team. The car was a huge success, offering an unparalled experience for the passenger who although sitting up higher than and behind the driver could still see the road ahead. The car had in excess of 700 brake horsepower and was powered by the same engine as the 1998 McLaren F1 race cars, and significantly it’s power to weight ratio and handling was very similar to the single seat F1 cars, achieved by essentially replacing the big fuel tank of the race cars with the passenger cockpit, and only carrying enough fuel for a few laps. Enjoy the video, it’s a classic bit of F1 history where two commentators talk you around the laps live form the cockpit. Yet another great video about Formula One Steering Wheels, from back in the day when Lewis Hamilton was still a loyal McLaren driver. Follow along as Lewis shows the evolution of the McLaren Formula One Steering wheel, from way back in the day with a steering wheel from John Watson’s McLaren with no buttons on it at all, through the Ayrton Senna steering wheels with a couple of buttons, to Mika Hakkinen’s steering wheel where we saw more evolution through to the wheel on Lewis Hamiltons 2010 McLaren. A fascinating history clearly showing not only the evolution of electronics and the associated buttons to adjust everything, but also the materials the steering wheels are made of and their coverings, from shiny hard leather to more grippy materials like suede. A cool insight into the technology of the 2013 Formula One Steering wheel, by Nico Rosberg and Lewis Hamilton. Between them they explain the main functions of the 2013 Mercedes Formula One Steering Wheel. If you watch this video, take the time to check out some of our previous steering wheel videos in the Formula One Steering Wheel category to see the evolution of the wheel as electronics gained momentum and took over so many aspects of the modern Formula One cars. It’s the time of year once again where the guestimates and educated guesses are made by the Spanish newspaper El Mundo Deportivo from information compiled by Business Book GP. Topping the 2013 list is Alonso holding steady at 30 million dollars, and he is joined by McLaren refugee and Mercedes new boy, Lewis Hamilton also said to be earning 30 million this year, up from 24 million in 2012. Button is holding on as the leading driver at McLaren a 24 million, while new boy there, Perez is up 1.25 million from 2012 to 2 million for 2013, which is a nice increase for him, but at the same time is saving McLaren some 22 million dollars after the departure of Hamilton. In 2012 Vettel and Webber had parity at Red Bull at 15 million dollars each, but this year Vettel is enjoying a 3 million increase to 18 million, while Webber remains on 15 million. Over at Mercedes the spending has increased significantly with the arrival of Hamilton, but Rosberg too is showing an increase over 2012, but only 1 million to 16 million, up from 15 million in 2012. Hulkenberg moved from Force India across to Sauber for 2013, and that move doubled his salary from 750,000 in 2012 to 1.5 million for 2013. Maldonardo, staying on for another year at Williams gets an increase, up to 1.5 million, up from 600,000 in 2012. Another doubling his 2012 salary is di Resta, staying on at Force India, earning 600,000 for 2013, up from 200,000 in 2012. As well as those above who all increased their earnings for 2013, a couple of drivers are said to have had salary cuts. Massa has apparently taken a 6 million dollar per year cut, all the way down to 9 million for 2013, down form 15 million in 2012. Raikkonen is also said to be taking a cut, down 2 million from 7 million to 5 million. Of course both of these drivers may have taken a upfront salary cut, but in reality it probably means that they have re-negotiated and are probably looking at increased bonuses for each World Championship point scored, so if they perform they may not be looking at an overall cut. Looking at the 2013 team spending on drivers, the 800 pound gorilla this year is Mercedes, spending a whopping 47.5 million on their lineup of Hamiltona and Rosberg. Ferrari has reduced their spend a little, coming in at 40 million, with Red Bull coming in third at a relatively economical 33 million considering they are the reigning constructors and driver World Champions. Although McLaren Mercedes has reduced it’s spend significantly after losing Hamilton, it is still spending 27 million on drivers this year. After those 4 teams, the spend on drivers drops off significantly, with Lotus spending only 6 million, Williams 2.5 million and the rest are all spending less then 2 million, with Caterham spending the least of all at 450,000. 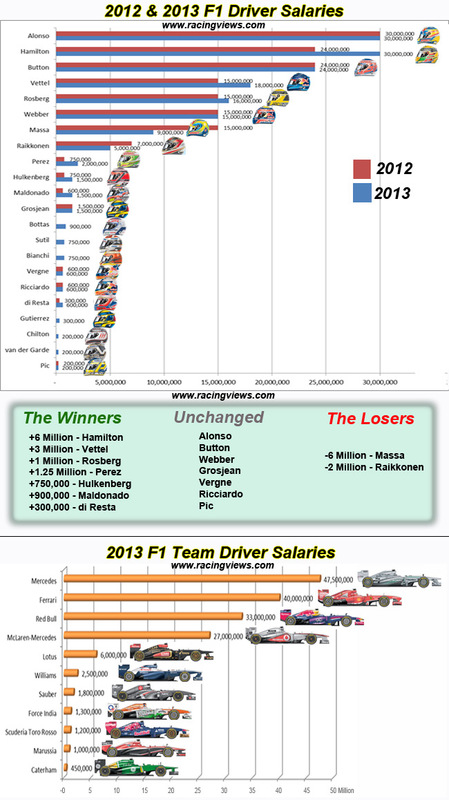 How much does each F1 driver earn?, and How much does each team spend on drivers?